Staff Sgt. 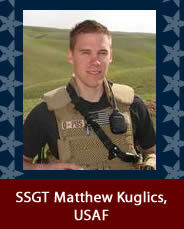 Matthew J. Kuglics, U.S. Air Force, age 25, of North Canton, Ohio, died June 5, 2007, in Kirkuk, Iraq, of wounds sustained when his vehicle was struck by an improvised explosive device. He was assigned as a special agent to the Air Force Office of Special Investigations.